Awesome!!!! Will this edition be available at the Poisoned Pen signed by you? Absolutely love these books and you can never have too many. I am almost finished with my 8th reread of the series and looking forward to MOBY and the TV show. Thank you for the story of Claire and Jamie. Historical fiction has always been my favorite and you include so much history into the story that it makes it seem even more real. These books have taken over my reading world. Nothing else can compare. Have a wonderful summer in all your travels. hardcover, large paperback, mass paperback,audio and Kindle version for travelling. Outlander became a significant part of my hectic life. 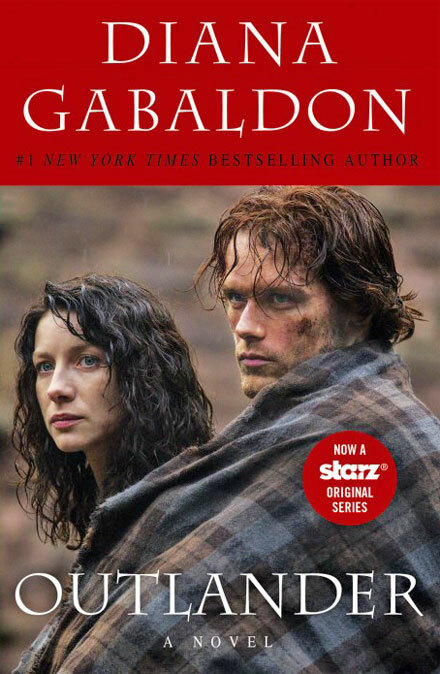 I read a lot of other books too, but then I always come back to read Outlander series again…and again…..Should I start calling it an addiction? I’d love to have a calendar with pictures from the TV series too! Diana, What do we have to do to get August 9th declared “Diana Gabaldon Day” in the US? Seriously, thank you for all your efforts in creating this amazing story, and making it so real that the only way to do it justice is via a cable series. I can’t imagine how disappointing a 2-hour movie version would have been…ughhh! (and indulge me here) KEEP UP THE FABULOUS WORK! I honestly don’t think it would have been humanly possible to pick two more perfect actors for these roles. This looks great. The part of the cover which shows the picture of the lead actor and actress is cut off on my screen. If the same thing is true for you you can see the full cover on Karen Henry’s blog, http://outlandishobservations.blogspot.com/. All you need to do is click on the picture on this blog and it will show in its entirety. Diana posted the graphic given to her by the publishers, which Diana’s website software didn’t like! So at first it did not show correctly on many devices. As soon as I saw it, I fixed that by editing the graphic and posting only the front cover. It should show up correctly now. If not, send me an email and include what type of computer or tablet or smartphone you are using. Yes, you’ll be able to get this book (and all the others) from the Poisoned Pen. I am confused by the pictures and Videos. I have been reading your books (and each one at least three times) since 1995, that is, nearly twenty years. And over the years, all the characters grew into images in my mind, pictures that formed from your words… and twenty years is too long a time to look at those faces now and contentedly replace my own pictures. I understand that the film means publicity and money, and both are good and necessary and needed, and I hope you will get plenty of them. Still I would have felt gratefull if I had had a choice to look or not to look at the pictures. My fortune is a weak eye memory, so I hope to have forgotten the looks of the actors by next week. Next month I will be sooooooo glad to cherish your new book! Dirtsa…. The twenty year image of the characters from your imagination should be nearly carved in stone for you. A fleeting glimpse of the actors should not replace your own impressions unless you like what you see better. I do find my own pictures of them returning even though I have loved looking at SH. Read number eight and I believe your own Jamie and Claire will return as gloriously as ever. Dirtsa—-simple solution. don’t read about the actors or watch the TV series. As you said the images you dislike will soon fade. I do hope you change your mind. It is going to be a great series. While living in London in 1992, I started reading a book recommended by a salesclerk called “Cross Stitch”. I passed it on to numerous friends, hooking them all. Since then I have lived in Paris, Zurich, and Montreal and I have been reading and loving the same story. I can’t wait for the newest book! Thank you for this series and I am looking forward to My Own Heart’s Blood. I have been listening to the stories on tape(and so likely have to wait some time yet for the novel) and would like to pass on my thoughts on the narrators. Davina Porter is the much preferred one by far, so I hope she will be the narrator for MYOHB and I also hope that you don’t leave some characters just hanging. I do have a fairly good imagination but would prefer if you finished the story lines. The Space Between – An Outlander Novella was a great read. At the end, your mind just went crazy imagining all the possibilities. It’s fun to know these characters and hope for them and wonder what will happen. I wonder if Diana knows herself! Dear Diana, do you have any idea of when the book 8 will be available in French? This averages 840 pages per book. Keep up the great work, all of us will keep on buying and reading no matter how many pages are in them and just PIFF all the negatives. I saw the review and had a fit of joy. Smiles all around Yeah! I picked up Outlander how many years ago, not being at all intimidated by the size of the book (huge, compared to others on the shelf) because I’m a fast reader. Got to the “end” and turned the last page, and said, “NO! It can’t be over yet! NOOOOO!!!!! !” Every book has been “too short” and I’ve been doing two- and three-year “sentences” waiting for each new book, “gobbling Gabaldon” (my spouse calls it) even though I swear I’m going to read slowly and draw out the pleasure. Loved the book. Have enjoyed everyone of them. The ending was great and I look forward to finding out about William, Lord John and Hal, Ben’s wife, what happened to Buck, will Rob Cameron show up at the Ridge.?????? Really enjoyed the time travel and all the various story lines.